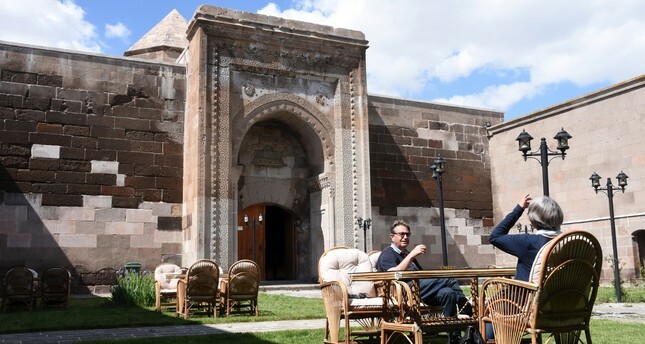 Karatay Caravanserai hosts guest who can eat and sleep at the place just like old days. Built in 1240 during the Seljuk period, the Karatay Caravanserai in the Bünyan district of central Turkey's Kayseri was one of the most important hans (large inns) on the ancient Silk Road. The caravanserai on the Kayseri-Malatya highway was built by Seljuk Vizier Jalal al-Din Karatay. Even though 778 years have passed since its construction, the han still stands with all its magnificence. The Regional Directorate for Foundations restored it 10 years ago and opened it for tourists. Now people can eat and have some rest here just like the old days. Before the han was restored, nearby villagers used it for storage. One of them, Cihan Kaya rented it for almost 49 years. Now he manages the caravanserai. Speaking to Anadolu Agency (AA), Kaya said that they put in a lot of effort to restore the han to its previous glory. "This was a very important structure on the Silk Road. It used to accommodate caravans. The part of the han used in summer has rooms and half-closed areas while the other part used in winter is totally closed. This is how people solved the heating problem, by staying together with their animals, in the past. The most important feature of caravanserais is that they have bathhouses, sick rooms and prayer rooms. If not, they will be regular inns. This caravanserai bears some authentic motifs. Students of art history come here to study. It is becoming part of history again," he said. Kaya added that the authorities did their best to protect the caravanserai's authentic architecture during restoration. "This place was used as a storage facility by the people from the surrounding villages." ose. It is used as a boutique hotel and restaurant like in the past. Our visitors can stay, have some rest and eat here," he added. Hamza Yağmur, a Turkish teacher at a local secondary school, said his students benefited from this piece of history. "It is very good that our history is being revived this way. This caravanserai is beautiful and will help the new generations learn their history better. We bring children here so they can see our history and culture."